Tennis Stars is one of the most entertaining sports-related online slots we have come across, and once you start playing it is easy to see why. While the sports theme is common among software developers, Tennis Stars is definitely one of the better options available on the market thanks to the experts at Playtech. The software provider is known for developing some of the most high-quality offerings, and this game just proves our point. Tennis Stars is full of action and intensity and can be played for free or for real money. Tennis Stars is attracting a lot of attention, and for all the right reasons. One of the reasons is the fact that the game features three bonus feature, including a lucrative free spins feature and an option to gamble your wins for double the rewards. This is a nice addition to the game and is triggered when you land three or more scatter symbols on the reels. Once activated, you will enter the men or women's singles. Here you must choose the type of serve, and the more points you win and the more aces you serve determines the cash prize and multiplier you will receive. This bonus game can also be triggered within the free spins feature. 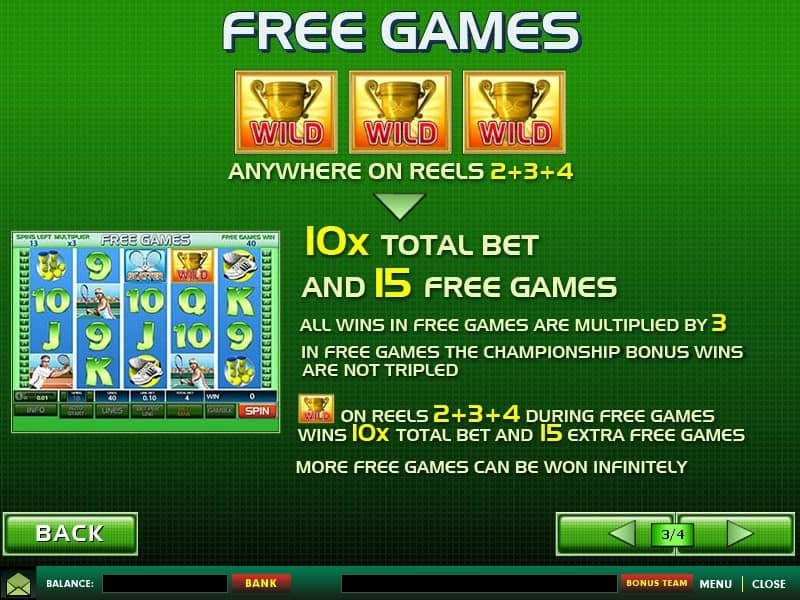 Speaking of free spins, this feature can be activated when you land the trophy symbol on the second, third and fourth reels. You will receive 10x your total bet for activating the feature along with 15 free spins. What's more, all wins earned during this feature will be tripled and the number of free spins achievable is indefinite since the feature can be retriggered every time you land more trophy symbols. Finally, if you are really feeling lucky, try the Gamble feature, which follows a double-or-nothing concept. Click on the Gamble button to activate the feature. You are required to correctly guess the color (red or black) of the upcoming card for the chance to double your wins up to 1000.00. However, a wrong prediction will result in all wins lost. Tennis Stars is a five reel, 40 payline online slot by Playtech that aims to pay tribute to the exciting global sport, specifically targeting the world of Championship tennis. All of the high value symbols are therefore related to the theme, including male and female players, tennis balls and tennis shoes. Lower valued symbols are represented by green playing card symbols. The trophy is the wild and triggers the free spins feature while the crossed tennis racquets launch the Championship bonus feature. The wild replaces all symbols to form winning combination. Three scatter symbols trigger the bonus game. Earn ten free spins and 10x your total bet. Tennis Stars is a star in its own right. This sports-themed game has it all - from excellent graphics and sound effects that really put you in the heart of the action, to bonus features that helps you win your own trophy in the form of cash prizes. Playtech has once again produced a top quality game that will appeal to both new and experienced players like. This medium variance game adds some fun and excitement to your online gambling experience.